Supreme Court Justice Ruth Bader Ginsburg, or Notorious R.B.G. as some of us like to call her, made TIME 's 100 Most Influential People list, which was released Thursday. The praise was well-deserved after the last year, when Ginsburg championed women's reproductive rights and refused to retire despite her age at 82, according to Elle. But, unfortunately, this badassery just wasn't acknowledged to the extent that 21 years on the high Court might warrant, and that could possibly be because Justice Antonin Scalia authored the piece that described Ginsburg's accomplishments. 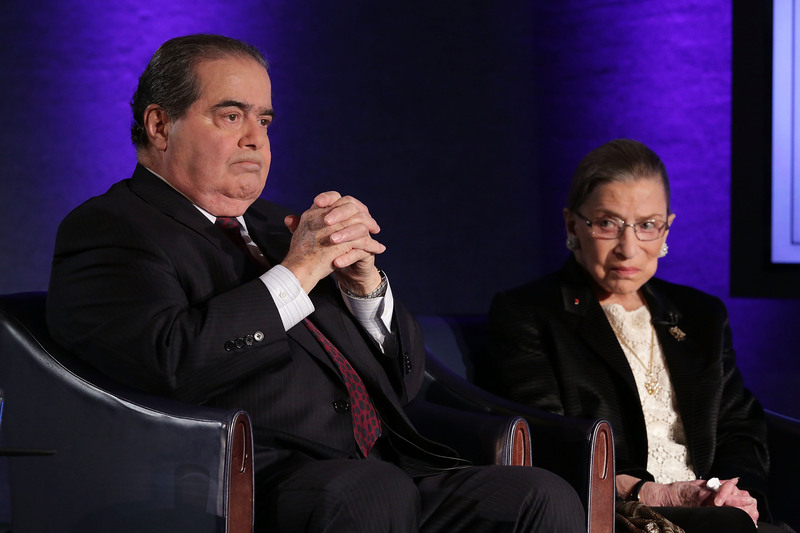 It's common knowledge that Ginsburg and Scalia are good friends outside of the court, according to USA Today. They allegedly both love the opera and celebrate New Year's Eve together every year with their spouses. But they have disagreed on fundamental issues, such as when the Court struck down the Virginia Military Institute's right to a male-only admissions policy, a case where Scalia was the only dissenting opinion, according to US News & World Report. So, it's great that the two can be friends outside of work, but it seems strange that Scalia would write praise about Ginsburg in the one area of life where he hasn't exactly been known for praising her. Even weirder, it was for a list that should glorify the work of those featured, not downplay it with phrases that describe her opinions as "always carefully crafted and almost always correct." People ask me sometimes... When will there be enough women on the court? And my answer is: When there are nine. Approving some religious claims while deeming others unworthy of accommodation could be 'perceived as favoring one religion over another,' the very 'risk the [Constitution's] Establishment Clause was designed to preclude. ... The court, I fear, has ventured into a minefield. When she was a law professor at Rutgers and later Columbia, she became the leading (and very successful) litigator on behalf of women’s rights—the Thurgood Marshall of that cause, so to speak. President Carter appointed her to a seat on the U.S. Court of Appeals for the District of Columbia Circuit in 1980, and President Clinton to a seat on the Supreme Court in 1993. ... What only her colleagues know is that her suggestions improve the opinions the rest of us write, and that she is a source of collegiality and good judgment in all our work. Maybe TIME thought this kind of reserved opinion, given by someone whom Ginsburg is often at odds with in her work, would allow Ginsburg's accomplishments to mean more or speak for themselves without the piece becoming worship-y. But that motive would be missing the entire idea that making it on the TIME list deserves worship, and, more importantly, Ginsburg has had so much more influence than what was discussed in Scalia's piece. When she wrote separately, concurring or in dissent, she stated her disagreement directly and professionally. She avoided castigating colleagues for an opinion that was ‘Orwellian,’ ‘profoundly misguided,’ not to be ‘taken seriously,’ and a ‘jurisprudential disaster. These were all words that Scalia had apparently used to criticize the opinions of other justices — criticisms that were often aimed at O'Connor. Being aware of this history helps make sense of Scalia's short and underwhelming piece on Ginsburg. Whatever kind of tension TIME was hoping would drive Scalia to let Ginsburg's feats stand for themselves actually led them to be left out altogether. And that's very sad, because she's had so many jaw-dropping achievements. She was the first female, tenured professor at Columbia Law School, according to US News & World Report. She told Bloomberg she has been fighting the fight on gender equality since she experienced gender discrimination in law school. These are a few of Ginsburg's impressive accomplishments that landed her on TIME's list. Scalia's description made her sound like just another activist for women's rights, when she is actually the activist for women's rights.